The Senate has basically given up on passing a climate bill. So where does that leave us? Yesterday, I noted on Twitter that the action is going to shift to the states and federal agencies. Remember, the EPA is obligated to regulate greenhouse gases under the Clean Air Act, and Lisa Jackson is moving ahead with those rules. (Here's my primer on that.) Meanwhile, as I've reported before, plenty of states are moving ahead with their own climate policies. There's already a (modest) cap-and-trade system for utilities in the Northeast called RGGI. California is planning to cut emissions 80 percent by 2050. And more than half the states have their own renewable-energy laws. 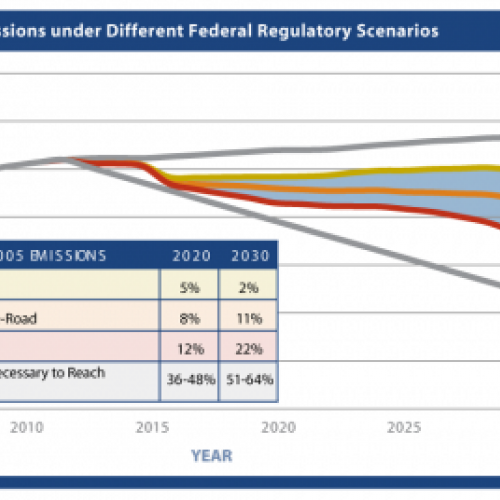 As you can see, federal regulation alone can't produce an 83 percent cut in emissions by 2050 (the level considered necessary to help the world avoid what's widely considered a dangerous 2°C increase in temperatures). Even what WRI calls a "Go-Getter" approach—ambitious federal regulations at the limits of what's technologically feasible—would only get the United States halfway there. On the other hand, most regulation-only approaches would keep the United States roughly on track in cutting its emissions through 2016, and at that point, who knows? Maybe the political landscape will have tumbled and shifted enough that Congress can pass proper climate legislation. So what would this federal regulation look like? It wouldn't just be the EPA. A lot of different agencies would have to work together in concert. The Energy Department would need to set tighter efficiency standards for appliances and commercial equipment. The Department of Transportation would have to use its authority to ratchet up fuel-economy standards for vehicles. The FAA would need to improve air-traffic flow to reduce fuel use in airplanes. And, meanwhile, the EPA would have to apply Clean Air Act rules to a variety of sources—power plants, industrial centers, landfills. Note that this is all likely to be costlier than a cap-and-trade system devised by Congress. There's not the same flexibility. One tool at the EPA's disposal, for instance, is the ability to require new power plants to adopt what's called "Best Available Control Technology" for pollution. But having the EPA pick and choose technologies is a lot less flexible and efficient than putting a price on carbon and letting the market sort out the cheapest, easiest ways to make cuts. That's one reason why polluters may start lobbying more heavily for congressional legislation once they see that the Obama administration is serious about wielding EPA authority. States can't contribute nearly as much (that's not surprising, since many of the biggest polluters like Texas aren't likely to adopt serious climate policies). Note that WRI's "Go-Getter" scenario here would involve various states developing their own cap-and-trade systems, which will be difficult to do. Still, if you combine state policies with EPA regulation, the United States is making some decent headway on its carbon pollution. Granted, it will be difficult—if not impossible—to negotiate an international climate treaty based on these scattered actions, but it's still progress. So climate policy isn't dead—it's just going to take a very different form.